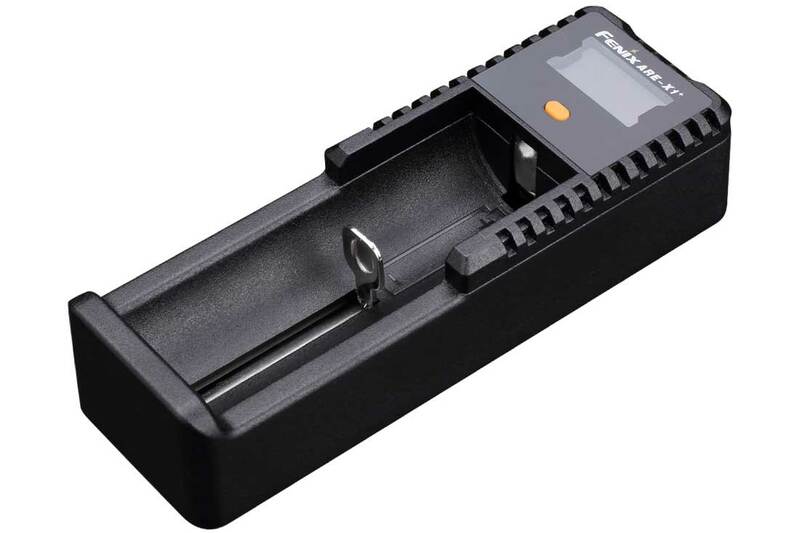 Note: The above-parameters (lab tested by Fenix using a CR123A Lithium battery and a 16340 rechargeable Li-ion battery) are approximate and may vary between lights, batteries and environments. Press the tail switch gently for momentary-on lighting or until it clicks to activate and lock the PD25. Press again to turn the light off. With the light on, press the side switch to cycle through four different brightness levels from Turbo → Low → Mid → High. Press the side switch and hold it for 0.8 seconds to enter into Strobe mode. When the flashlight is in strobe mode, a single press on the side switch will return the light to general lighting mode. The Fenix PD25 memorizes the last brightness level used in the general mode, but it will not remember the strobe mode. The next time you turn the flashlight on, it will activate the last brightness level you selected. PD25 will accumulate a lot of heat when it is working in Turbo output. To avoid overheating, the flashlight will automatically transfer into the high brightness level by working in Turbo output for over 5 minutes. If the Turbo output is needed continually, just reset it again. When the voltage level drops below the preset level, the PD25 is programmed to downshift to a lower brightness level. When this happens in Low output mode, the flashlight blinks three times every five minutes to remind you to replace the battery. Note: The function only works when the light is powered by 16340 rechargeable Li-ion battery. If the voltage of the 16340 battery drops below 3V, this function will be invalid when the light is turned off and then on again. Unscrew the light head to put in the battery with the anode (+) toward the light head, then align the threads and screw the light head back on. Unscrew the tail cap one-half turn or take out the battery to prevent accidental activation during storage or transport. Notice: The routine cleaning video can be watched and downloaded through Fenix official website, please click the service channel->“maintenance for light”. The PD25 is a high-intensity lighting device capable of causing eye damage. Avoid shining the light directly into anyone’s eyes. Great flashlight, the tail clicky is smooth and perfect. Lightweight and durable. Only minor complaint is the color temp, its kinda purple tint, i like neutral, just a personal preference. I own multiple fenix flashlights from 8 years ago, they’ve taken a beating from hunting, camping and fishing, underwater and still perfect. Outstanding compact flashlight. I’m using it as a weapon light and is preforming excellently in that role. It is the most compact, highest output, tail activated flashlight I’ve found so far. Love the little PD25. Four levels of brightness really comes in handy. The Fenix ARB-L 16-700U battery is the coolest thing I have seen in a long time: Mini USB port on the side to recharge! Great product, I give them as gifts. I will order more as the need arises. I love the miniature PD 25. This is the 10th Fenix flashlight I have purchased. I also have two phoenix headlamps. I love all of them and plan on adding to my collection. Love my old PD20. Also love my new PD25. Excellent flashlight. Perfect for work, camping, hiking, and around the house! A great flashlight for the money. It is very handy and I use it for everything. Excellent light, bright and easy to use. I like quite a few things about this light. The one negative I can say now is that it’s not able to tail stand. That’s a feature I really appreciate for some tasks, and I was not aware of this being an issue prior to purchasing. I’d look at another option before making the purchase if I had it to do again. This is my forth PD25 because they are well made, a great value, and best of all the mode button is on the side, NOT incorporated into the rear button. The rear button of the PD25 is mon/on/off only. I use the PD25 on weapon systems that have a lack of hand guard real estate, ex. AR-9 with a 5.5 inch barrel. Nice size for pocket EDC and the light, at its highest setting, is very bright. I’ve been carrying this daily since I got it. The PD25 is the best single CR123 battery flashlight on the market. The price is great, comes with a rechargeable battery, fast free shipping, but best of all, and the main reason I purchased PD25, it that the modes are controlled by the side button, not the end cap button. Once the mode (light level) is set, the end cap button is mon/on/off, as it should be. The only improvement I would recommend is the the strobe setting be made apart of the mode selection so that the strobe is immediate available when end cap button is pressed, instead of having to press the side button once the light is On via the end cap button. I do exhaust work they do very good. This is my fifth Fenix light and like the others it’s awesome. I can’t believe how bright it is for such a small light. Would highly recommend! Fantastic little EDC light. Top quality craftsman ship as twice now i have knocked from a 6 foot tall locker onto concrete with no issues. I have not had any accidental pocket fire. (accidental turning on) …. The battery with the USB charging is new to me but i pull it and charge it during lunch time and it is ready to serve me the rest of the afternoon. I use the light in a professional setting and as of to date i am pleased as i am with all my Fenix lights……. Buy one !!!! I carry this light in my backpack. Super light weight, very bright. I do carry a few batteries which is very convenient as they are small. Highly recommend this light. This is my 2nd Fenix flashlight (my first being he UC35 V2.0) I’ve purchased in the past few months, and I’m thrilled with the products that Fenix has produced. This PD25 is super compact and powerful, and maintains a great charge with the included 16340 battery. I only wish I could recharge it without removing the battery. If I could do that, it’d be a 5* review. I highly recommend the Fenix lights. Handy size for EDC and battery seems to last FOREVER. For EDC this is easily the best light out there… I would even argue the best light, period. It is super-powerful but easy to change modes. The design with the mode selector on the side and simple tactical button on the rear keep it easy to work even under stress, and it is the only way to go for a multi-mode light. Note that it stays in the same output mode unless you specifically change it with the side selector, unlike other competitor models that change every time you turn it on or off which is an absolute pain in the rear. The small size and light weight make it disappear in my pocket or mount well on a long gun without significantly changing its balance. This new rechargeable battery with a built-in charger blew my mind!!! I’ve carried an older less-powerful version for years and recently upgraded to this newer version that I love even more. The old one is now my weapon mounted light on my home defense rifle if that shows how much I trust these things– literally with the lives of my family. I hope to eventually have one more for the wife/backup. For an EDC light, this is one of the best. And at this price point, it’s fantastic. I have 2 and they are still going strong after years of daily use/abuse. Turbo mode disappears when battery life gets lower, and I would love a low battery indication led, otherwise awesome little light. I AM VERY PLEASED WITH MY NEW FENIX! The power settings are intelligent and turbo mode is FREAKING AMAZING! Fenix inceased Turbo to 550, but decreased High to a pathetic 150, vs 200 on the 22UE! Since Turbo is always heat limited to 5 minutes or less, the usable brightness levels now are LESS than on the PD22UE. Fenix seems to want to boast Max levels at the expense of the more usable levels. It would make far more sense to have High be 350, Med 200, etc so you have more usable brightness levels to choose. I lost my 22UE, I’m not buying this to replace it. Hopefully there’s a 25UE or a 26 coming soon. I have been EDC carrying Fenix lights since the P1D (RIP, killed by a 3 story fall onto concrete). Of the several generations of Fenix lights I’ve had since 2007, this is the best of the bunch that I’ve carried for daily use on the job. The brightness and beam pattern is great and the controls are easy to use. One thing that always bothered me with the first lights was having them always start on medium, but not so with the PD25, it stays on whatever mode you set the last use. The PD25 is reasonably efficient with CR123 batteries, but combined with the USB direct plug in rechargeable 16340 battery you can minimize battery costs. As a side benefit Turbo mode is noticeably brighter on the 16340 battery. I typically upgrade my light and hand the old one down to my wife or friends when a new model comes out or I see someone I know in need of a great light. As this point I’ve purchased five of the PD25, not one has failed and not one person has been anything but pleased with them. One place that could use some improvement is the holster. I understand that most people probably never use it, but I use the holster that comes with the light on my belt. They last me about a year before the nylon breaks down and needs to be replaced. I wish Fenix would make an upgraded holster for these little lights that I could buy, or at least sell the included holster separately. When I hand down the lights the holster goes into my drawer for reserve. This Is a great flashlight that I carry in my pocket all of the time. It is small but powerful, well built and something I can count on when I need it. 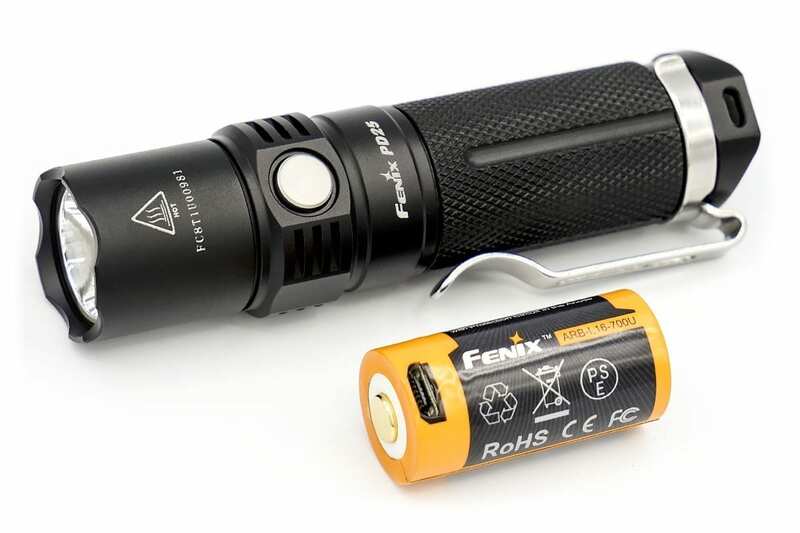 This is my 5th Fenix flashlight and certainly won’t be my last! I just spent a week in St. Petersburg, Fl. with no power thanks to Hurricane Irma. The PD25 was a perfect light for extended usage. The low light setting extended battery life and was perfect for indoor use so as to not blind the other occupants of the house as you move around. The higher brightness modes were ideal for being able to peer down the street and around the block when surveying damage, looking for lost pets for neighbors and when using the diffuser tip to light an entire work area or room. It fit perfectly in my pocket and I never had to change the battery. A truly outstanding and flexible light. One of the best, it has great power in a small lightweight package. It will likely fit into and carry style and has some defensive features as well. I have many Fenix lights starting from the tiny E05, E99Ti up to the PD35 – however my very favorite is the PD25. I do wildlife rescue and rehabilitation and the PD25 has excellent brightness, very simple on and off and brightness button, and is handy/easy to carry in my pocket. For my needs in a flashlight, the PD25 is by far the best – perfect! Great light for EDC, I’ve owned 3 of them. My only issue is the clip. I’ve lost 2 lights because it just pops off if you attached it to your belt. I’ve started carrying it in my pocket. I’ve had it for over a year, still rocking strong. Could have been a perfect pocket flashlight for camping and outdoors, if they didn’t take out SOS function. I truly don’t understand why they made the stupid decision of taking the SOS out from PD22. I have numerous other brand flashlights. I was absolutely amazed at the features and brightness of the PD25. I tested it in the Sig Sauer Academy Pro Shop and it was incredible. It was the middle of the morning in the well-lit store and the PD25 fully illuminated the back wall from the front of the store. As soon as I saw the output- I said “SOLD!” and the employee laughed. I didn’t think this kind of performance was possible from such a small light. I definitely recommend this light.